The Rising Stars Challenge is an exhibition basketball game held by the National Basketball Association on the Friday before the annual All-Star Game as part of the All-Star Weekend. The players are first- and second-year players selected by the NBA's assistant coaches. Two people designated as "general managers" draft players for the two opposing teams. The Rising Stars Challenge is an exhibition basketball game held by the National Basketball Association (NBA) on the Friday before the annual All-Star Game as part of the All-Star Weekend. The players are first- and second-year players selected by the NBA's assistant coaches. Two people designated as "general managers" draft players for the two opposing teams. The Rookie Challenge, established in 1994, was originally competed by two randomly selected teams composed entirely of first-year players. This format was continued until 1996, when it was changed to pit rookie teams of both the Eastern and the Western Conference against each other. In 1999, the game was cancelled as a result of the NBA lockout. Since the 1998 rookie class did not compete that year, the game was revamped and featured a team of standout first-year players ('Rookies') against a team of standout second-year players ('Sophomores'). For 2012 and 2013, the format was changed to having two teams drafted by Basketball Hall of Famers Charles Barkley (Team Chuck) and Shaquille O'Neal (Team Shaq). In 2014, the two teams were drafted by Chris Webber (Team Webber) and Grant Hill (Team Hill). 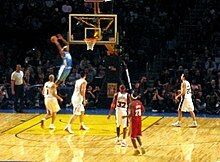 The format of the game and name was changed to the Rising Stars Challenge in 2012. The game format changed in 2015 to USA vs World, where each team should choose at least three Rookies and three Sophomores, and the squad of each team should have four back courts, four front courts and two swingmen. Unlike regular NBA games, the game was divided into two twenty-minute halves, similar to college basketball. The participating players were chosen by voting among the league's assistant coaches. In the game, players wear their respective regular team uniforms, except for 2009, in which players wore fan-designed jerseys. The head coaches of the two teams are the lead assistant coaches of the NBA All-Star Game coach. Starting in 2009, two active NBA players were added to the game coaching staffs. The game is currently sponsored by Banco Bilbao Vizcaya Argentaria (BBVA). Before 2012, the event was known as the Rookie Challenge, officially named the T-Mobile Rookie Challenge and Youth Jam. What a crowd. Got a request? Leave a comment here. http://ask.fm/gearmast3r The best highlights from the 2013 Rookie Challenge in Houston. A compilation of the best plays from the the 2004 NBA Rookie - Sophomore game.